$600 Instant Savings! See Full Info Below! 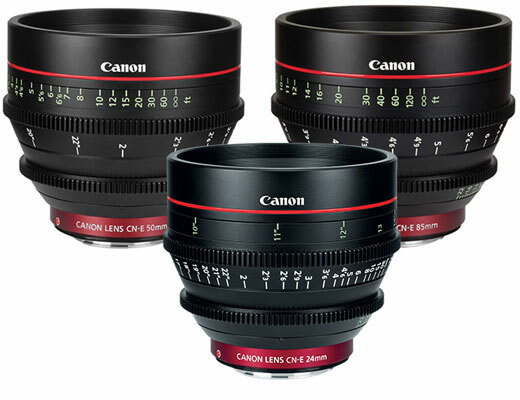 Apply for a Canon Cinema Prime 24mm, 50mm & 85mm Lens Package lease: 1.99% & 0% Interest Lease Program. Canon ITCG, in partnership with Canon Financial Services, Inc. is offering 1.99% financing for 36 months and 0% for 24 month leases. Includes: Three total lenses (one each): 6569B001 CN-E24mm, 6570B001 CN-E50mm, 6571B001 CN-E85mm. Canon EF Cinema Prime Lens Product Discount Program: get a $600 discount for purchasing these three lenses together! The EF Cinema prime CN-E50mm T1.3 L F (EF mount) lens offers a compact, consistent lens design and proven Canon lens elements for performance and reliability in professional shooting environments.